Lately I have been playing extensively with WebSharper and have been working on improving the structure and reusability of Bootstrap components built with WebSharper. I like writing HTML from F# as it allows me to reuse code by using namespaces and modules to group reusable functions and elements. Over the last couple of month, I have tried many ways to make functions which facilitate the creation of Bootstrap components and tried many ways to group them into meaningful modules so that it is easily findable for the next time I want to use them. Out of all the solutions I’ve tried, only one really stood out and it is what I want to share today - Method chaining to build Bootstrap components. 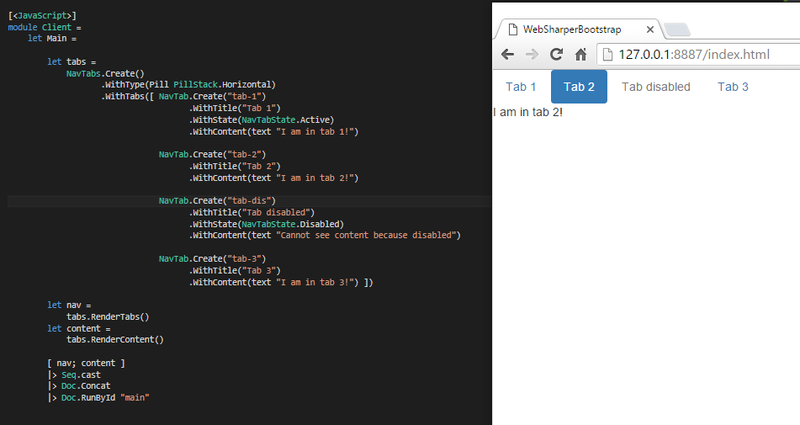 WebSharper exposes some functions to create HTML tags under WebSharper.UI.Next.Html. Each HTML tag has its equivalent, for <div> you will find div to create divs without attributes or divAttr for those with attributes, for <table> you will have table and tableAttr. To specify attribute you can use Attr or attr like so pAttr [ attr.``class`` “text-muted” ] [ text “Hello world.” ]. The first argument of each xAttr function takes a list of attr and the second argument is a list of Doc. A Doc is a representation of a DOM element, it can be any ensemble of elements.